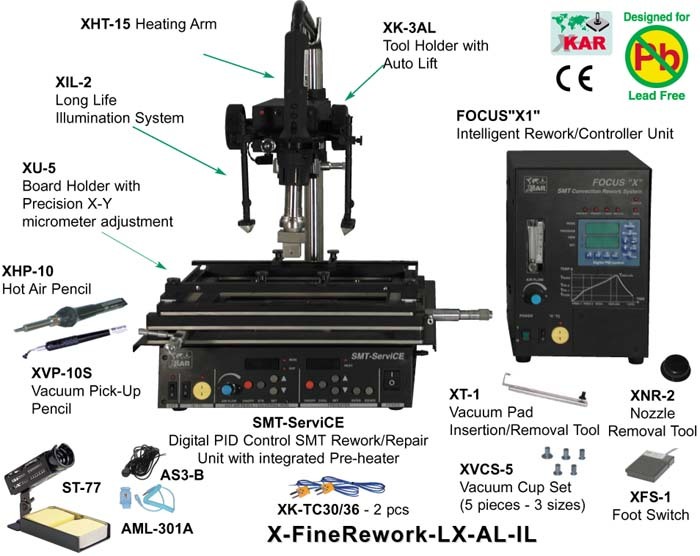 X-FineRework-LX is a Unique, Modular Digital PID Control SMT Rework/Repair System with a Pre-heater. This new generation system offers precise and accurate monitoring of process temperatures at a working point on a PCB. Also, allows pre-setting of exact temperature of air stream at the end of Hot Air Tool, Hot Air Pencil Nozzles and at a tip of Soldering Iron. 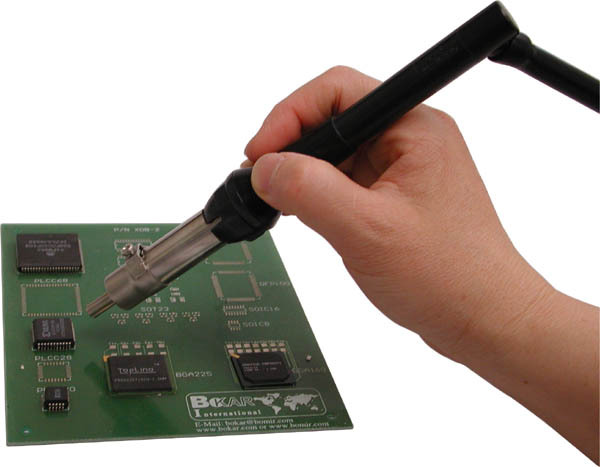 Board Holder with X and Y micrometer adjustments and precision rotation stage allows fine alignment of a component with the corresponding land pattern on the board. The accuracy is achieved by a unique feature, user adjustable offset, which compensates for differences in PCBs' being reworked (dual or multi-layer, high and low mass) in case of pre-heater settings, and differences in tips or nozzles in case of soldering iron tip and hot air stream temperature settings. The unique, high performance of the unit is possible due to use of the newest microprocessor technology and thorough programming of all control and monitoring functions combined with PID temperature control of all heaters. Programming updates via direct connection to PC using USB port. Programmable in five zones (top heater) and simultaneously in five zones from the bottom (pre-heaters). Air Volume Control of the Pre-heaters (User setting from the front panel). Digital display of settings and actual parameters on front panels. Repeatability of the process from board to board (digital storage of profiles and settings). 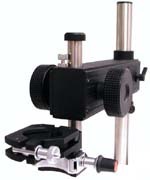 Enhanced alignment of a part with pads on a board with precise rotation of a top hot air/gas tool, which is mounted in a fine adjustment rotation stage. Ease of use. Rework process controlled by Focus"X" control panel. Both Focus"X" and SMT-ServiCE can be used as independent Rework Systems. 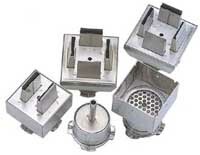 Large selection of standard, lightweight nozzles. Custom nozzles are available upon request. Built-in Hot Air Pencil/Iron and Vacuum Pick-up Tool. Self-contained air and vacuum sources. Solid and strong metal (not plastic) construction guaranteeing long service life. 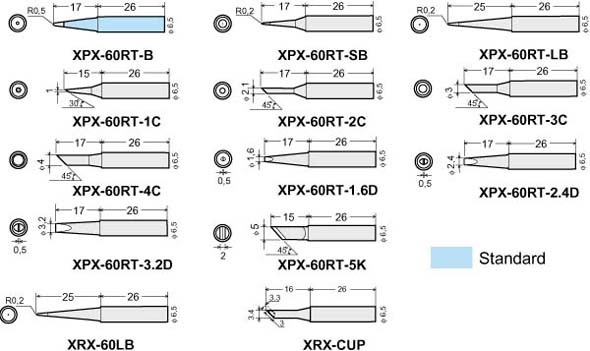 Compatibility with all X-KAR Brand Rework Attachments and Accessories (XIL-2 High Intensity, long life Illumination System, XHT-1P Small Handle Hot Air Tool, XmP-1S Micro Print Head Set, XK-AL Series Holders with Auto Lift at the end of reflow cycle, etc.). 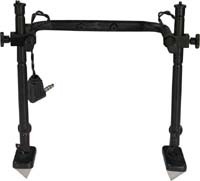 XK-3AL - Tool Holder with Auto Lift. 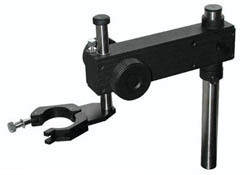 This holder will replace XK-3, and will lift XHT-15 Hot Air Tool with a component upon reflow when connected to Focus "X" or on demand by pressing either a push button on the XK-3AL or XFS-2 foot switch. XHT-1P - Small handle hot air pencil (250W) for Focus "+"